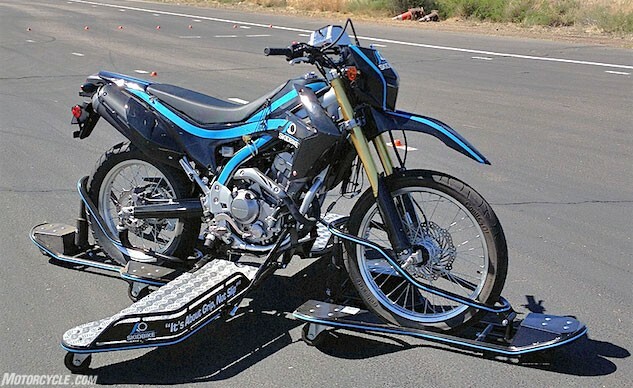 The Coolest Motorcycle Training Device Ever! It’s the moment of reckoning for the motorcyclist-in-training. The time when clutch plates come together, and balance and forward motion begins. The fear of rocketing out of control and crashing horrendously is palpable. But it doesn’t have to be this way. 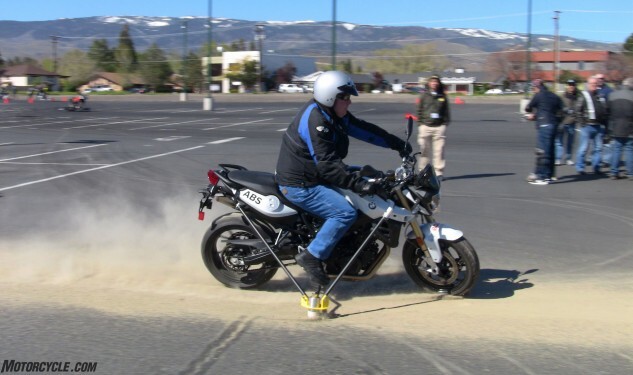 Cedergrens has removed all the monster-under-the-bed scariness of learning to operate a motorcycle and replaced it with a Skidbike security blanket. Skidbike is based on Cedergrens’ Skidcar concept developed around 30 years ago. Cedergrens MEK, a 100-year-old family-owned business located on the coast of a Swedish island in the Baltic Sea, created an hydraulically controlled set of training wheels and attached them to a car to simulate a loss of friction such as when driving on wet pavement or ice. 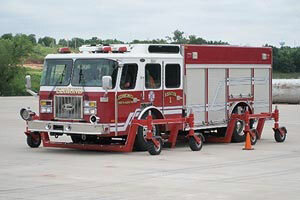 The concept was well received, so Cedergrens expanded the concept to include buses, ambulances, fire trucks, etc. The Skidcar system became successful worldwide, and now Cedergrens is turning its attention to the two-wheel market with its Skidbike. Neither did EiC Kevin Duke or I. The initial impression from aboard the Honda CRF250L trainer bike is, to say the least, a little strange. “The rig feels like you’ve got two squished shopping carts caught underneath the bike, threatening to tug the bike off its line depending how each caster wheel grabs an uneven section of asphalt,” explains Duke. But this is the complaint of a skilled rider. For the first-time motorcyclist, the comfort of knowing it’s impossible to fall over is invaluable and worth the shopping cart caster inconvenience. Skidbike allows for a full-lock slides while defying gravity – and all while traveling less than 20 mph. Notice the lifting mechanism behind the front wheel attached to the carriage. There’s an identical unit at the rear wheel. These allow the instructor to independently raise the wheels from the pavement, decreasing traction and simulating a slippery road surface. The result is a safe and fun experience for both novice and experienced motorcyclists. The outriggers are adjustable to a lean angle of up to 35 degrees. So if the front end of the bike does wash out, there’s a momentary feeling of falling. A rider can also experience the sensation of a high-side, either by locking the rear brake when leaned over then releasing it while still in motion, or by accelerating to initiate a powerslide and them chopping the throttle. While not necessarily part of the curriculum, occasional high-siding is bound to happen with experienced riders testing the limits of what is dynamically possible. As much fun as we had with the CRF250 Skidbike, the KTM 1190 Adventure Skidbike is where our real interest was vested. Since the advent of cornering ABS, we’ve been loathe to fully test the technology by grabbing a handful of brakes while leaned over in a corner. Understandably so, because the typical reaction to this action is to crash. Forgive us for not fully performing our duties, but in this case we were willing to take the manufacturer’s word that the technology worked mostly as described. Backed by the safety net of the Skidbike system, Duke and I found our bravery and set to the task of doing exactly what you’re not supposed to do mid-corner. 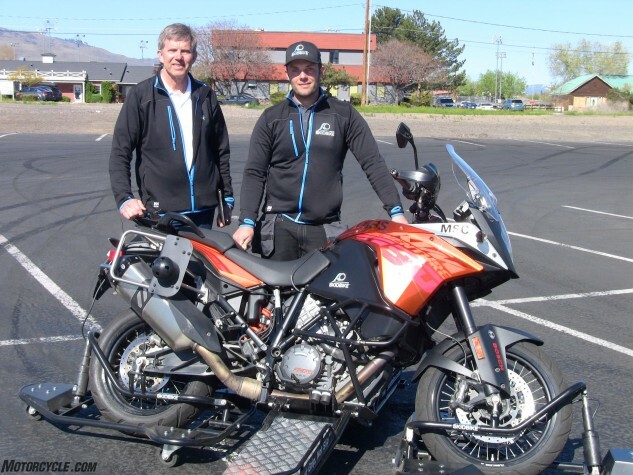 “The Skidbike platform proves to be an excellent tool for evaluating the KTM’s electronic rider aids like Cornering-ABS and traction control,” says Duke. “To me, C-ABS might well have been a fairytale for as much as I ever dared put it to the test. ‘So, you say I can grab a handful of brakes while leaned over? Right…’ But with the Skidbike, that test can be repeated over and over again until the tank runs dry. The International Driver & Rider Training Symposium had a sandspit available for ABS demonstrations. With the Skidbike’s ability to decrease traction, the reduced-traction stopping ability of ABS is also on display. Currently, there exists more than 300 Skidcar systems in the US, mostly for law enforcement purposes. Skidbikes are much fewer (five or six), but also much newer. One of the early adopters of this technology is Pennsylvania’s Motorcycle Safety Program, which has invested into Skidbikes for its rider training program. 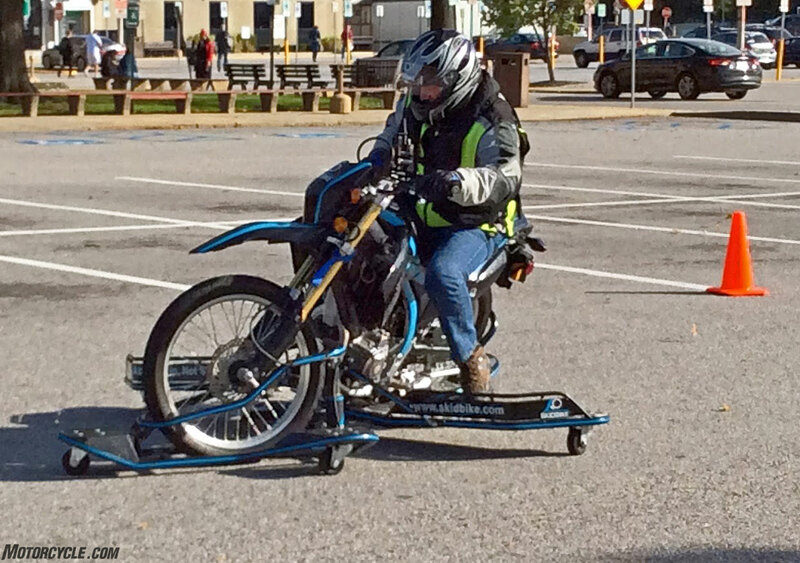 “With the intent to further enhance training to mitigate crashes, PennDOT unveiled a new dimension in motorcycle safety training with the introduction of the Skidbike as a tool for experienced and beginning riders alike. Pennsylvania is the first state to incorporate this technology into its motorcycle training programs and will use it initially to train new riders,” Pennsylvania’s Department of Transportation recently announced. A hindrance to quickly implementing Skidbike into U.S. rider training programs is cost: $19k for the CRF rig; $23k for the KTM – not including the bikes. There seems to be consensus among the rider training professionals in attendance at the International Driver & Rider Training Symposium that Skidbike poses an obvious benefit to new and experienced motorcyclists, as well as rider coaches. As far as Duke and I are concerned, Skidbike is a solid investment, an excellent teaching aide, and a helluva lot of fun for everyone. For more about Skidbike check out skidbike.com.